A.P. Moller Maersk said on Tuesday a U.S. Department of Justice (DoJ) investigation into the practices of container shipping companies had closed and the group was released from any obligations. In 2017, the DoJ ordered top executives from several container shipping lines including Maersk to testify in an antitrust investigation over practices by an industry that is the backbone of world trade. "We are pleased to confirm that the United States Department of Justice has closed its investigation into containerised shipping and has released Maersk from any obligations under the Grand Jury subpoenas issued during the March 2017 meeting of the International Council of Containership Operators," Camilla Jain Holtse, A.P. Moller Maersk's head of competition law and policy, said in a statement. 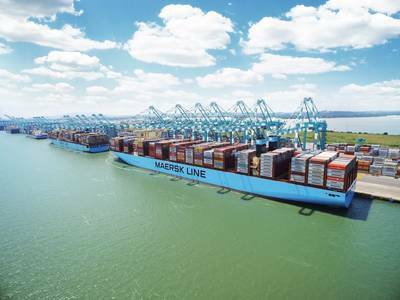 Holtse added that Maersk, which is the world's largest container shipping company, had provided full co-operation throughout the investigation. "We believe the DoJ’s decision to release Maersk reflects our strong commitment to competition compliance governance and structures over the years." The investigation could have resulted in large fines at a time when the container sector is struggling with slowing global economic growth. Last week, Maersk warned trade headwinds would slow container demand growth this year, sending its shares 10 percent lower. The stock was down 1.53 percent at 1121 GMT. The U.S. probe followed separate ones in recent years by other jurisdictions. In 2016, European Union antitrust regulators accepted an offer from Maersk and 13 competitors to change their pricing practices in order to stave off possible fines.